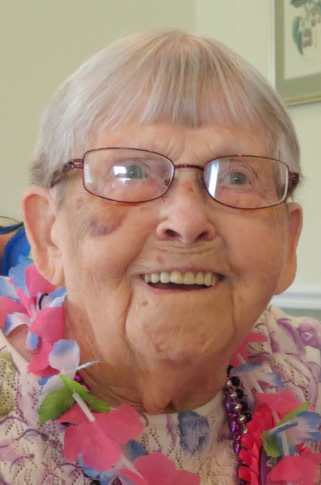 Eunice M. Profit, 105, formerly of York Township, passed away at 8:40 a.m., Sunday at the Colonial Nursing Center in Rockford. She was born on June 6, 1913, in Spencerville, Ohio, the daughter of the late Grover C. And Viola (McMillen) Bowersock. On October 27, 1933, she married Keith Albert Profit who also preceded her in death on July 5, 1997. Family survivors include a daughter, Kathryn Smith of rural Ohio City; a sister, Mary Jane Conrad of North Carolina; a daughter-in-law, Joyce E. Profit of Rockford; three grandchildren, Terry (Vicki) Profit of Van Wert, Gregory (Tammy) Profit of Rockford, and Michael (Jennifer) Profit of Rockford; eight grandchildren, Zach (Danielle) Profit, Brock (Bianna) Profit, Kyle (Taylor) Profit, Ryan (Andrea) Profit, Shania Profit, Delyna Profit, Rodney Perry and Kaitlin Perry; and eight great-great-grandchildren. Besides her parents, Eunice was preceded in death by a son, Larry K. Profit; a son-in-law, Wally Smith; and eleven brothers and sisters. There will be private services at the convenience of the family. Preferred memorials are to the Middle Point Volunteer Fire Department.